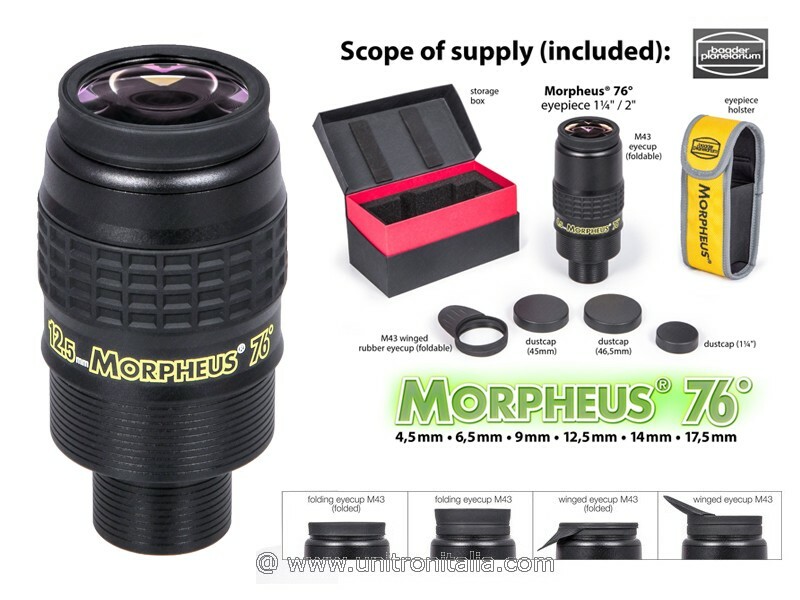 Due to their shape, design and low weight, the Morpheus® eyepieces are the best eyepieces to use in a binoviewer. 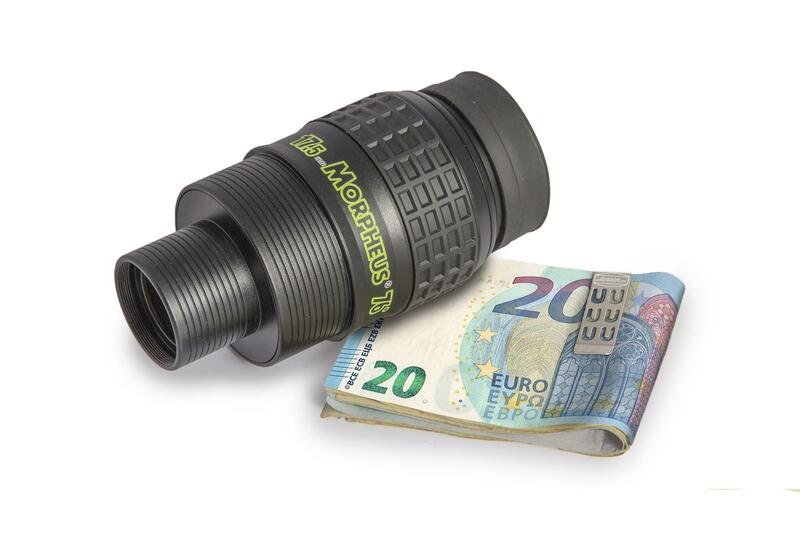 No other eyepiece series has been designed consistently for this use, while offering the same (true) field angle, minimized vignetting and providing a 55 mm outer housing diameter throughout, to allow binoviewing even for children with just 55 mm interpupillary distance. The slim outer body has been made as small as possible, without any metal added simply for look or feel. The "eye-lens-group" is sized so very large, to make the viewing behavior totally stress-less. Even at too large a viewing distance the object remains visible - a feature very appreciated by public observatories with lots of untrained visitors. You will not find an eyepiece that gives a better "space-float effect". Especially when using both eyes, the edge of the field of view virtually disappears, creating that famous spacewalk-feeling - like "floating in space". 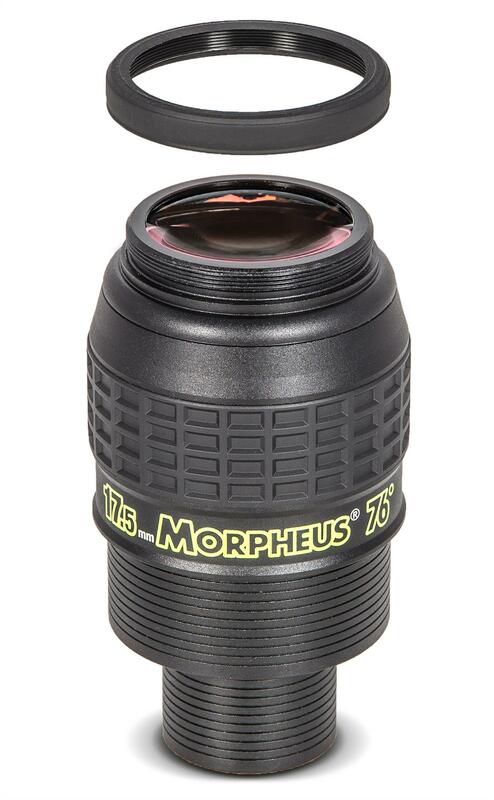 •	Full Field Sharpness: The sharp, flat 76° field is unsurpassed by any other modern wide field eyepiece. On-axis sharpness and contrast rivals the Zeiss Abbe II eyepieces, while delivering nearly equivalent performance over the full field. Stars remain diamond pinpoints as you move away from center, and the field remains flat and in focus, even in short focus telescopes. •	Long Eye Relief: Morpheus® pushes the envelope of comfortable wide field viewing further than ever before, delivering close to 20mm of eye relief along with best-in-class optical performance. Eyeglass wearers can comfortably take in the full field, and users of Binoviewers will find that Morpheus® are the ultimate eyepieces for viewing with two eyes. •	Low Distortion: The highly sophisticated optical design delivers exceedingly low distortion (angular magnification distortion). Planets and lunar features retain their shapes as they transit the field and the true field sizes match the theoretical value. 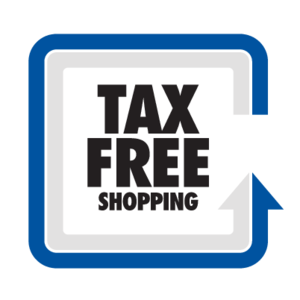 Many companies exaggerate at this point and deliberately use off axis distortion magnification as a means to advertize blown "apparent" field sizes . You will be able to compare this given field size of 76° and find it to be the true value, calculated from the apparent field size and focal length. •	Immersive Views: As avid observers ourselves, we have studied the behaviors of most commonly available wide field eyepieces and listened to other observers comments on what eyepieces give the most palpable and engaging wide field viewing experience. What we found is that the subjective ‘spacewalk’ feeling is not just a function of field of view. Interestingly, some wide-field eyepieces with fields of 82 degrees failed to deliver the same viewing experience as others with similar fields, or even some with smaller fields. We found two additional primary factors played into the equation – Eye Relief (and the related large eye lens size) and Ease of Viewing (a combination of long eye relief and control of pupil aberrations). We also found that fields much below 74 degrees tended to have a reduced effect. So, with this information in hand, we set out to design the Morpheus® series with a field of view of 76° that met all of the other optical parameters necessary to deliver a truly "immersive" viewing experience where the eyepiece essentially disappears. •	Phantom Coating® Group: Pioneered in the Hyperion® lineup, the Phantom Group Multi-coatings have been further optimized for use in the Morpheus® and index-matched to each of the different glasses. •	Optimized Internal Baffling: As with all Baader Planetarium eyepieces, the internal mechanicals have been fully ray-traced and baffled to eliminate the effects of stray-light and reflections. •	Optimized for Binoviewing: Every last bit of space has been squeezed out of the main body to minimize its size, giving maximum nose clearance for binoviewing. •	Weight reduction: Every effort has been made to eliminate unnecessary weight - especially in view of effective binoviewing. The weight of all Morpheus® eyepieces essentially are the lenses inside plus the best protection and water resistance we can supply. •	Foldable Eyecups: The folding rubber eyecup incorporates an integral M43 threaded metal attachment ring. This threaded attachment enables the eyecup to be soft and compliant, while keeping the eyecup securely attached to the eyepiece when folded or extended. The second included special winged version provides the ultimate comfort and exclusion of stray light necessary for binoviewing with eyeglasses. These eyeguards have been developed to provide the optimal comfort and eye spacing for most users and eye glass wearers. The eyeguards also protect the M43-thread which is used for adapting a camera, as described on the back of this brochure. The M43-extension can be used for setting the eye relief as well as for adapting a camera. •	Safety Features: The 1¼" and 2" Barrels of each Morpheus® incorporate our Slip-Protect Safety-Kerfs. The ideal safety compromise between smooth barrels and wide undercuts. The numerous shallow kerfs give additional grip and security from inadvertent drops from smooth sided barrels, without the annoying problems sometimes caused by traditional wide undercuts. Wide waffle-patterned rubber grip ring gives an extra measure of handling security. •	Luminescent Labeling: The labeling glows in a soft green, if the eyepiece has been in the light for some time, or if it has been illuminated directly with a flashlight. This allows you to recognize immediately which focal length you have in your hand – even in the darkest night. •	Belt pouch: Not enough space at the telescope? The pouch does not only protect the eyepiece – you can even use it as a belt pouch or attach it to your tripod. 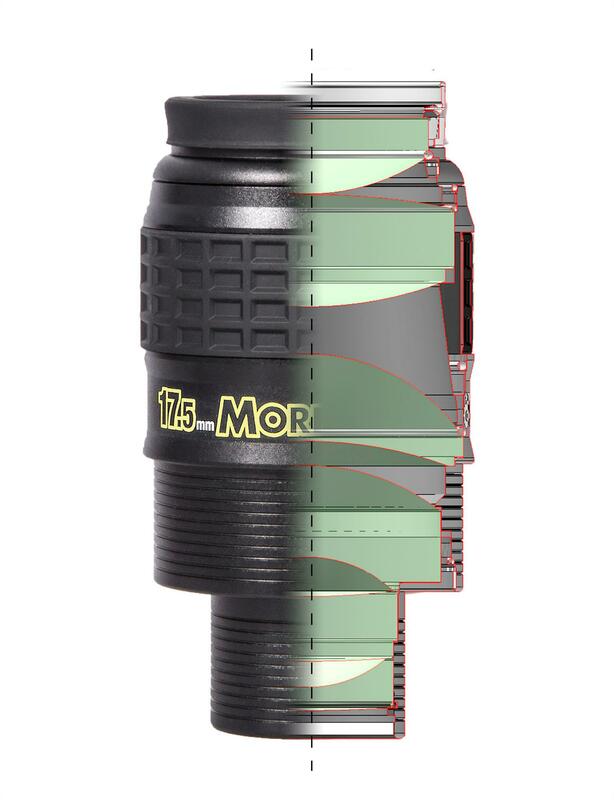 •	Photo-Video Adaptation: Like their Hyperion siblings, all Morpheus® eyepieces make superb imaging projection optics. Each Morpheus includes a hidden M43 photo-video eye lens thread that permits use of our extensive range of Hyperion Digital T-Rings. These rings permit direct-thread attachment of practically any imaging device for the ultimate in rigidity and close-coupling for minimal vignetting.